Double world and triple European champion, Germany's Robin Szolkowy would seem to have what it takes to claim the Olympic figure skating title along with his diminutive and complicit partner Aliona Savchenko. 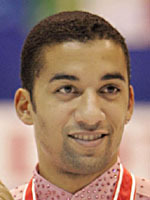 The son of a German nurse and a Tanzanian doctor (whom he has never met) Szolkowy was born in Greifswald, East Germany, where he took to skating by sheer chance at the age of four. Athletic and elegant in equal measure, Robin switched from solo to pairs at 16 when he swiftly became German junior champion with Johanna Otto (1999, 2000), then again with a new partner Claudia Rauschenbach in 2001, who however soon decided to quit. After a period of training alone, Szolkowy's match made in heaven came along in 2004 in the form of the highly ambitious petite blonde Aliona Savchenko of the Ukraine, and the two immediately hit it off on the ice. Trained by Ingo Steur, who won a bronze at the 1998 Nagano Games with Mandy Wotzel, the pair soon claimed the first of a series of national titles. The couple racked up the tournament wins too taking the trophy at Nebelhorn and Skate Canada in 2005 and just ahead of the 2006 Turin Games, Savchenko gained German nationality. Their Olympics however was tainted by off-rink politics as Steuer was outed as a Stasi collaborator (secret police from the former communist regime) and thrown off the German delegation. He was allowed to travel to the Games at the last moment but the demoralised couple failed to galvanise their best form and came sixth. Although Steuer was fired by the German federation he continued to work with the pair whom he soon led to stunning success after stunning success with European titles in 2007, 2008 and 2009. They also won world championship gold medals in 2008 and 2009. Steuer-Wotzel had been European champions in 1995 and world champions in 1997. The pair are seen as avante-gardiste in their choice of costume, music and routines, which sets them apart from their more conservative Russian and Chinese rivals. They also enjoy a visible complicity and seem to thoroughly enjoy their job. They may be perfectionists but they also take risks, so barring accident, the Vancouver gold in 2010 should be well within their capacities.